Climate activist Bill McKibben has worked hard since last November. Touring American college campuses, speaking to sold-out audiences, he has urged students to target their schools’ investment funds. Apparently, when carbon dioxide is combined with money the world turns into a fireball. But CO2 is a byproduct of virtually everything we humans do. Such as breathing. Such as baking bread. Healthy plants rely on CO2 to such an extent that commercial greenhouses add it to their climate-controlled atmospheres. This speeds up growth, increases yields, and makes plants more drought-resistant. Those of us who are passionate gardeners understand that, while too much of anything can be a bad thing, the great outdoors would be noticeably more lush if the amount of CO2 in our atmosphere were to magically double or triple. An elevated CO2 level is only something to get alarmed by if you are prepared to accept an assumption made by the people who program climate models. That assumption says that planet Earth (which, let us remind ourselves, has managed to keep itself intact for 4.5 billion years), is so unstable that a trivial change in atmospheric CO2 will set off a chain reaction that will amplify a small temperature increase by two, three, or more hundred percent. This mechanism is called positive feedback. Almost every process you can think of in nature operates by negative feedback. Climate scientists, many of whom have been exposed to eco-apocalyptic narratives their entire lives, have no proof that their positive feedback theory is correct. They simply regard it as a given. In other words, if positive feedbacks were not programmed into their climate models, the climate crisis would not exist. That’s the honest-to-goodness, plain-speaking, truth. But let us return to the planet-as-fireball graphic. Like all brilliant pieces of propaganda, it waves away the inconvenient, messy real world and substitutes a silly fiction. Activists are currently targeting fossil fuel companies such as oil producers and coal mines. But if emitting carbon dioxide while making money turns people into planet killers, we’re all guilty. Bakeries, restaurants, coffee shops, and fast food outlets use CO2-emitting energy to refrigerate and cook the food and beverages the rest of us purchase. Hospitals emit CO2 when they power operating rooms, intensive care wards, oxygen machines, and premature baby units. The people who work in those institutions wouldn’t have a job if that wasn’t the case. The entire transportation industry – which includes subways, buses, trains, airplanes, and trucks – earns its living via CO2 emissions. Which means that anytime we purchase medication at a pharmacy supplied by transport truck, place an order online, or send a birthday card via the post office, we’re supporting people who earn their living by emitting CO2. Preschools, elementary and secondary institutions, colleges, universities, and extended learning programs all use heat, light, and lots of electric power. Moreover, each of these relies on myriad forms of CO2-emitting transportation to ferry students and teachers to the same physical location. Without CO2, none of today’s professors would have a paycheque. 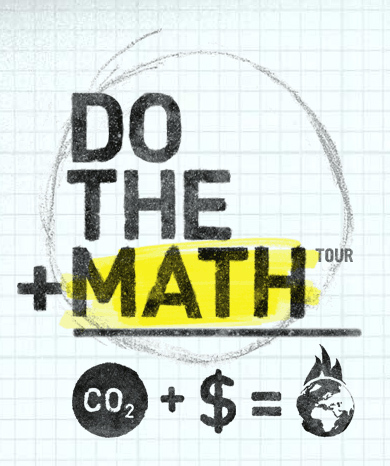 CO2 and money, therefore, are firmly entwined. Almost no one can claim to earn a living untainted by the emission of CO2. Farmers certainly can’t, since energy is required to plant and harvest their crops and then to transport those crops to customers. McKibben himself doesn’t qualify. He spends his time flying from one community to another on CO2-emitting aircraft in order to denounce our CO2-based way of life. The fireball graphic, therefore, makes no sense. It’s a declaration against everything. Which means that while McKibben’s Fossil Free Divestment Movement may be stylish, it’s profoundly short on substance. This is a movement that pretends to be about math yet eschews basic arithmetic. This is a movement that encourages Garden-of-Eden fantasies, relying on the emotional manipulation of idealistic young people. Take a look at the front page of the Math350.org website. It features a video in which the 53-year-old McKibben poses with a clenched fist raised above his head. I suppose he feels like a rock star. I suppose there’s nothing quite so intoxicating as imagining yourself a superhero saving the planet. To me he looks like a reckless narcissist. This entry was posted on May 26, 2013 by Donna Laframboise in Bill McKibben, ethical & philosophical and tagged Bill McKibben, Warren Meyer.